I feel that this list is sorely inadequate, having been relatively inactive in the Methodist world online in the past few years. I am especially interested bloggers in the Great Plains Conference. What blogs do you recommend? Maybe yours? But today, due to the Internet’s transformative power, faithful people can custom-design their own religious experience in whatever way they see fit. Creating discipleship content and being discipled is no longer confined to being connected with a church; anyone with an Internet connection can grow in their faith. I don’t agree completely with the paragraph above but see how it could be appealing. What do you think? Do you agree or disagree? According to their website, The Table is a relational, online web application, custom-tailored for the church. We aim to engage the community, empower leaders, and move people beyond the pews and into authentic, life-changing friendships. Check out this video and let me know what you think – Would your church find something like this to be helpful? I have been inspired by Kevin Watson’s series of posts about the Methodist Class Meeting. It was part of what made the Methodist movement powerful. I have hoped to use the following series of posts as a guide for leading class meetings when I am the lead pastor at a church one day. The Methodist Class Meeting for the 21st Century: Who Is This For? Is the Class Meeting Judgmental and Exclusive? I am glad that Chris Brogan had a good experience with church online at LifeChurch.tv. Chris is a well known social media practitioner and has a good deal of influence in some circles. He wrote about his experience with worship online at Digital Church. I am glad that more people are spreading the word about church online. 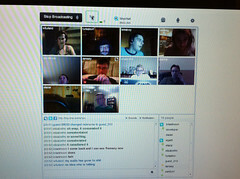 Resurrection Online (www.rezonline.org) is still in its infancy and has room to grow. A rising tide lifts all boats. I recently came across the proposal for a Twitter Communion service and its subsequent cancellation. As Pastor of Resurrection Online, I have spent a good deal of time considering how sacraments are made available for those that worship online. I am still working on articulating clear guidance for Resurrection Online attender. This proposal is particularly intriguing to me as it is from a British Methodist, who shares a similar theology and founder in John Wesley. Here is a video of the proposal. What are your thoughts, feelings or opinions about this Twitter Communion?